While government responses to disasters have improved in most countries over the past few decades, and disaster warning systems mean that we've been steadily reducing fatalities for all but the most sudden of events, there has been very little in the way of systematic study of life after disasters are over and clean up crews long gone. This is despite the fact that many humanitarian agencies, (e.g., Oxfam in this report about Cyclone Nargis) have been sounding the alarm on disasters' aftereffects for years; getting families out of harm's way is obviously tantamount, but families which return to disrupted livelihoods, damaged homes, and bankrupted businesses have a hard time ever getting back on their feet, a result that may be pernicious but subtle to detect in the absence of good data. A host of observational and qualitative research has arrived at similar conclusions, suggesting that systematic suffering may be common in disasters' wake. At the same time, a growing body of work in the applied microeconomics and modern environment and development economics literature finds that even relatively minor changes in the natural environment can have major demographic effects when correctly identified and measured. Sharon Maccini and Dean Yang's paper on the long-term effects of bad rainfall outcomes at birth and Baird, Hicks, Kremer, and Miguel's paper on the long-term effects of a child deworming intervention in Kenya are two fairly classic examples of this, and the new review by Dell, Jones, and Olken has more. 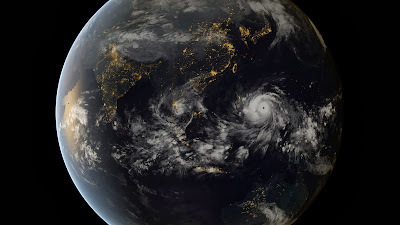 It seems logical that the large-scale physical damage, disruption of services, and general stress caused by natural disasters would likely result in social costs at least as large as those due to bad rainfalls or parasitic helminths. That said, it's been difficult up until now to produce estimates of disasters' impacts that can be interpreted causally (or are "well-identified" as we say in econometrics), partly due to lack of data and partly due to the fact that disasters are generally uncommon enough that the statistical power needed for all but the grossest of calculations was lacking. In this paper we effectively seek to provide an answer to the question posed by the humanitarian agencies and field researchers by using the sort of well-identified methodologies of the applied microeconomists. To do this, we carefully estimate the effect that a specific type of disaster, typhoons a.k.a or West-Pacific hurricanes, has on a specific set of household economic and health outcomes in a specific context, namely the Philippines. The advantage of our approach is that the high frequency of typhoon strikes within the Philippines, coupled with the long period of observation in the survey datasets we use, together allow us to estimate the effect of storm incidence for households within a specified region and across years. In technical language we are able to use fixed-effects (within) estimators in a distributed lag model to control for the average relationships between regions and years with our outcomes of interest, while simultaneously estimating how disasters' effects vary in the months and years following impact. In nontechnical language, this means we can make statements about the average impact that storms have on households both the year that they impact and in subsequent years, and can be reasonably certain that in doing so we're not simply conflating disaster impacts with broader regional or time-varying trends. The data for the paper come from three major sources. 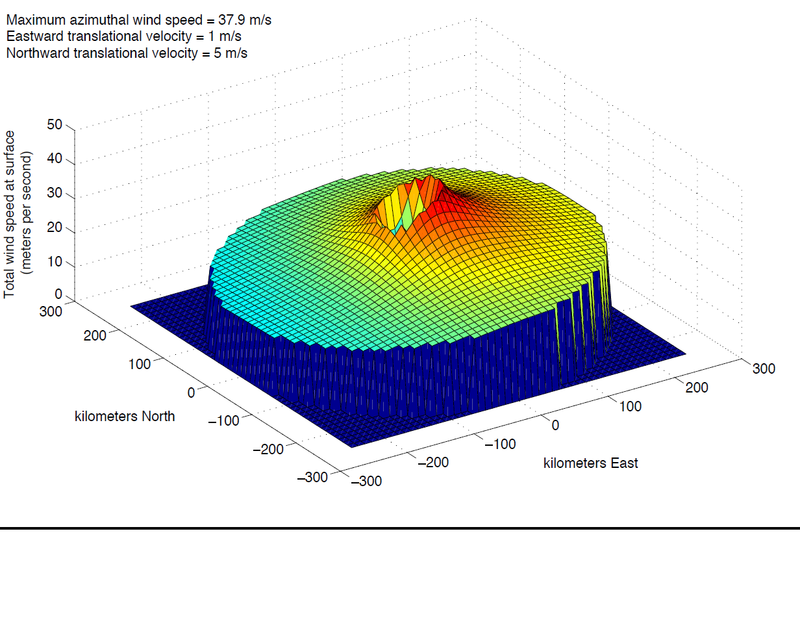 The first are the typhoon data themselves, the result of earlier work by Sol on the macroeconomic effects of tropical cyclones. 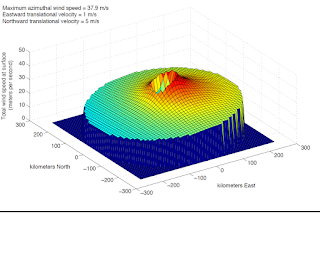 These data allow us to estimate the maximum wind speed (a reasonable proxy for cyclone intensity) experienced by a given region of the world over any period of time going back several decades. The second data set is the Filipino Income and Expenditure Surveys (FIES), collected and tabulated by the Philippines' National Statistical Office. These data contain multiple cross-sectional surveys on household income, expenditures, and similar economic outcomes for 8 survey years between 1985 and 2008. The third major data set we rely on in the paper are USAID's Demographic and Health Surveys' data for the Philippines. These data sets contain infant and maternal health survey data including retrospective histories of infants' births and, where applicable, deaths, resulting in detailed infant mortality histories spanning three decades across the Philippines. 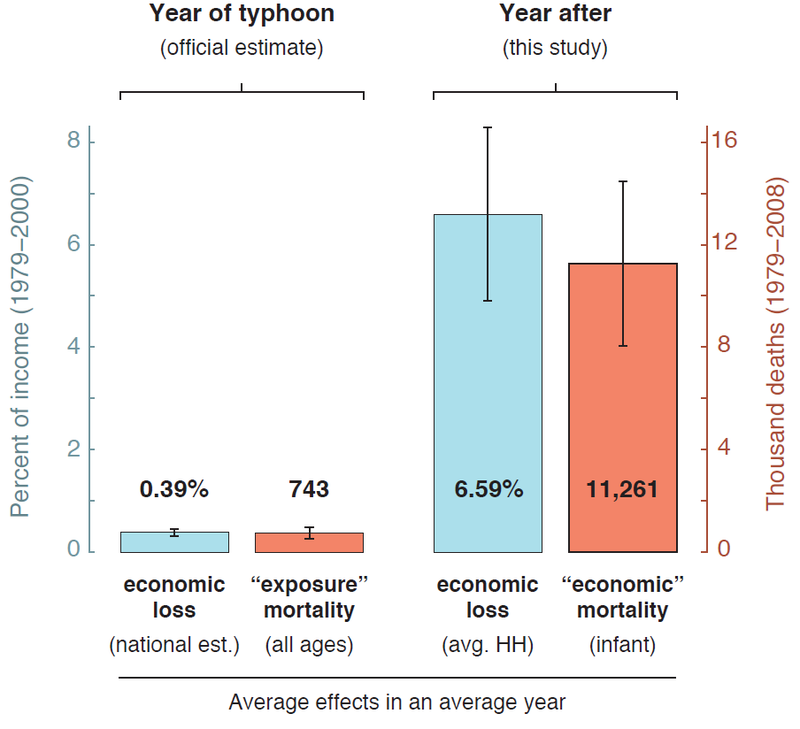 The result of all this data work is that we're able to quantify the average impact of typhoons on households not only at the time of impact, but several years after the storm, while still managing to control for potentially confounding "average" associations between where people live and their local typhoon climate. 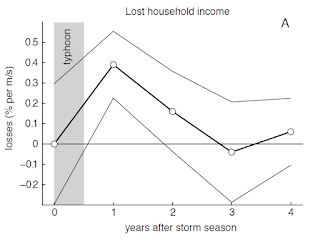 First examining the economic data, we find that household income drops precipitously upon storm incidence but not until the year after storm impact, as shown in the graph of income losses by years since storm impact at right. These reductions of income include any offsetting transfers such as remittances and span several sub categories of income type, implying that storms leave a legacy of systematic economic damage among households in their wake. 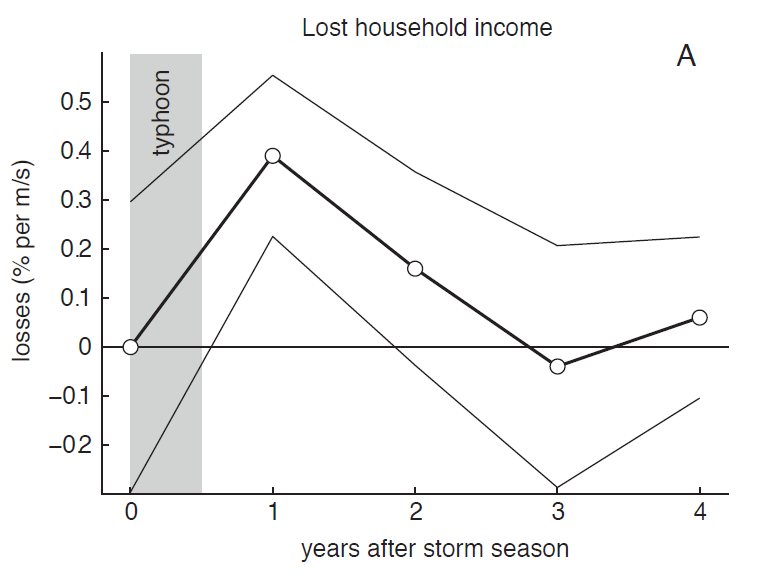 We check to see whether the losses to income that we estimate from storm incidence translate into reduced consumption, and find that households reduce expenditure by more or less the same amount that their incomes go down. 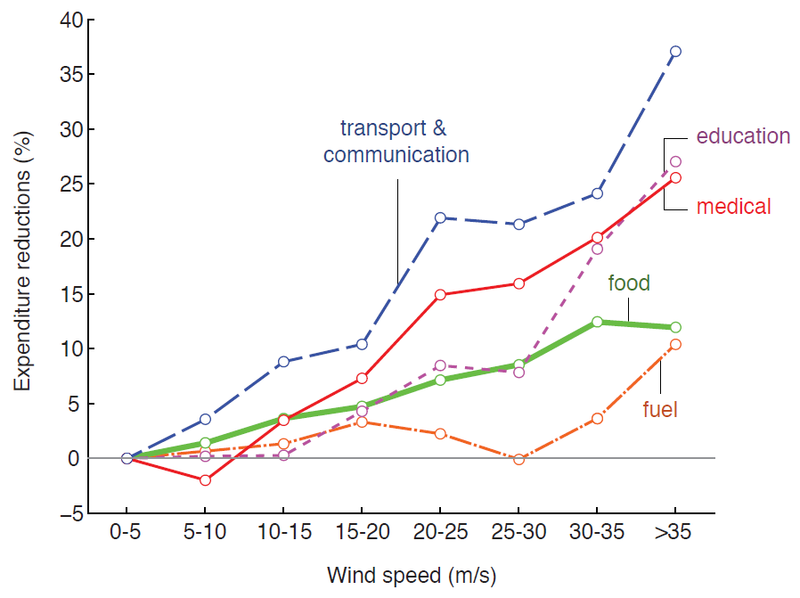 This shouldn't be too surprising given that our income data is net of transfers, but it implies that any additional means that households might have of smoothing out their consumption of goods over time are insufficient for dealing with the large aggregate shock of the storms. 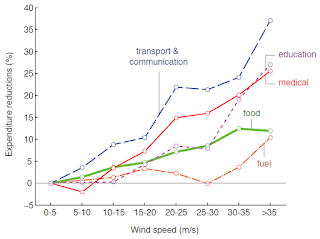 Breaking out expenditures out subtypes, for example in the figure at left, we find that in the year after storm incidence households are particularly liable to reduce spending in health and human capital "investment" goods such as education, medicine, and nutritious foods such as dairy and meat. This result is intuitive but depressing, implying that households made poorer by the storms are forced to make limited ends meet in the wake of the storm and cut back on exactly the sort of long-term investment goods that help lift families out of poverty. 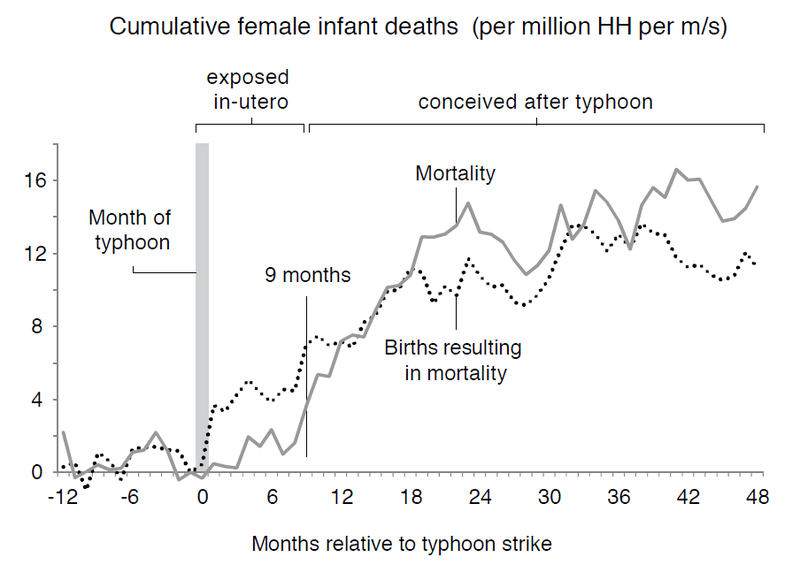 infant female cohort mortality due to storm exposure. Together our results suggest that we have all of the makings of a bad environmental shock which result in bad health effects within households; to test this hypothesis we turn to the DHS' infant mortality data. What we find is a large increase in infant mortality rates that mirrors our income and expenditure findings, but only among female infants. Such a large gender disparity in impacts may seem surprising, but is fairly common within development economics, where gender bias in response to shocks is common, especially in the presence of even mild preferences for sons over daughters (see, for example, Duflo 2005). While we are unable to directly link households' economic data with their infant mortality histories, we do run a variety of different checks to verify whether the two results are plausibly linked. We run several tests to see whether infant mortality matches the "where, when, and who" of income and expenditure losses, and find that the pattern of losses matches up in a variety of regional or socioeconomic subsamples. 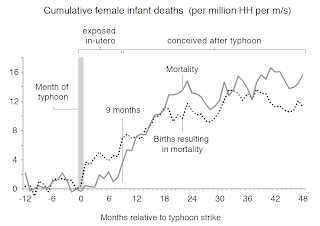 We check the timing of deaths (as in the monthly cumulative deaths figure above) and find that not only are the preponderance of deaths occurring well after storms have passed, but that the cohort mortality rate continues to rise up to and through the 9 months after storm incidence, implying that babies are dying due to storms which occurred before they were even conceived. Lastly, we check to see whether household composition influences mortality outcomes, and find that infant girls with older siblings and especially older brothers are particularly likely to die. One of the notable aspects of this paper's results is the size of effects compared to previous estimates. The figure at left shows a comparison of two estimates of average damages due to typhoons: one calculated for damages occurring during the year of typhoon using aggregated national data, and the other our estimate as calculated the year after at the household level. 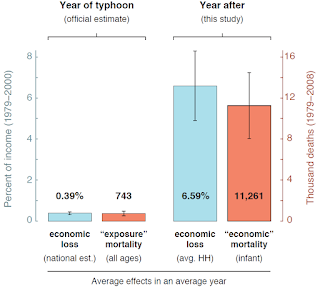 We find that both the total number of deaths (lagged infant due to economic circumstances vs. instanteous adult as reported by EM-DAT data) as well as losses to income (lagged household income vs. year-of reported capital damages) in an average cyclone season are approximately fifteen times as large when measured at the lagged micro level as opposed to the immediate national level. So what can we do? The primary policy implication for post-event response would seem to be putting sustained focus on maternal and neonatal health in the humanitarian response to storms, as well as ensuring that social safety net, credit market, or insurance mechanisms are in place to help affected families reestablish livelihoods as quickly as possible after storms. Taking a longer view, there are a variety of risk management policies that would likely attenuate the impact of storms, ranging from hardening infrastructure to enforcing building codes and providing safer housing for very low income populations currently living in quasi-legal and flood-or-landslide prone settlements. More generally, we view this paper as demonstrating that the natural environment can inflict systematically large if difficult-to-observe damages to households in developing countries, and that those damages can occur via explicitly indirect economic channels, e.g., via disinvestment following loss of income. This suggests that estimates of the cost of natural disasters might be systematically biased downwards due the difficult of observing lagged damages or slow-moving adaptive responses, a particularly salient concern given the increase in extreme weather events predicted to occur under climate change.